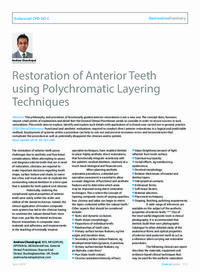 Abstract: The philosophy and procedure of functionally guided anterior restorations is not a new one. The concept does, however, require small points of explanation and detail that the General Dental Practitioner needs to consider in order to secure success in such restorations. This article aims to explore, identify and explain such details with application of a clinical case carried out in general practice. Clinical relevance: Functional and aesthetic evaluations required to conduct direct anterior restorations in a logical and predictable method. Employment of systems within a procedure can help to rule out and prevent erroneous errors and inconsistencies that complicate the procedure as well as potentially disappoint the clinician and/or patient. Objective: To provide an update on the materials, equipment and clinical techniques that will allow clinicians to optimize all stages of direct anterior composite restorations in clinical situations where aesthetics is the main patient concern.